The Richmond Community Nativity Pageant, which is performed each Christmas season at the Carillon in Byrd Park, is probably the oldest public Christmas tradition in Richmond. 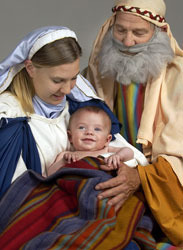 The "Nativity" is a live presentation out of doors with a cast and choir of approximately 200 persons, which include many family members, some of whom have been in the annual Nativity Pageant 30, 40 and some 50 plus years. Douglas Southhall Freeman was the original narrator. This interdenominational, inter-racial, Christmas event draws persons in attendance not only from the Richmond metropolitan area but also from across Virginia. In recent years, 1,000 to 3,000 people have attended to witness this moving and inspirational 30-minute production that continues to be a blessing to the lives of countless thousands or Richmonders who experience this glorious reenactment each year. Several years ago, when a young member of the Nativity Pageant cast was asked why he traveled from the west coast of the United States each Christmas to be in the "Nativity", he said, "It wouldn't be Christmas without the Nativity Pageant." If you are interested in being in the Nativity we would love to have you. People from all ages are needed. Click here to find out more! If you would like to share this wonderful event with church members, friends and business associates please download the Nativity Announcement (PDF file) print it and put it up at work and church. Also ask if your church will put this information in your church newsletters. If you would like to attend this is a free event and all are welcome. Please invite your friends, neighbors and church members to come. Directions and time/date of the Nativity. Though this is a free event to the public it costs approximately $15,000 annually to produce. If you would like to support this annual event click here to find out how you can help.